Rollovers As Well As Obstacles Such As Cattle, Trees, And Rocks. ARLINGTON, SD — Jan, 1 2015 — ATV Body Armour, the world’s leading manufacturer of off-road vehicle protection equipment, announced today the release of the new ATV Body Armour product, a 360-degree round, tubular frame that’s designed to protect ATV riders against cattle, trees, rocks and other objects as well as help preventing rollovers, which are a leading cause of injuries for ATV enthusiasts. 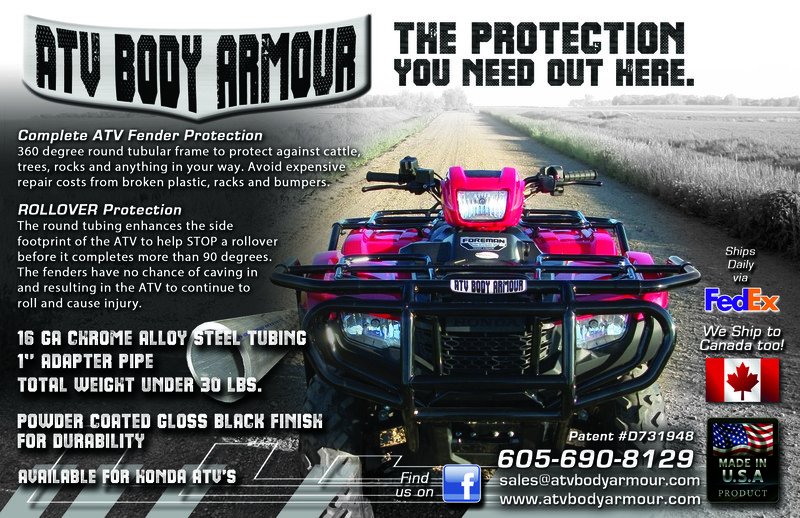 Unlike other ATV frames, which only provide partial protection, the ATV Body Armour product provides a unique, patent-pending protection around the front, back, and sides of the vehicle. The product, which weighs less than 30 lbs., is made out of 16-gauge chrome-moly steel tubing and features added bends for strength. The tubing is also powder coated in black for added durability and scratch resistance. The ATV Body Armour product is made with pride in the USA, it is designed to fit all utility (i.e. with cargo racks) ATV brands and models, and the full kit takes less than 15 minutes to install. The ATV Body Armour product can be purchased at the ATV Armour website (www.ATVBodyArmour.com) for just $550 for the full kit or just $350 for the side kit, and it is available to customers worldwide. Follow ATV Body Armour on Facebook at www.Facebook.com/ATVBodyArmour. ATV Body Armour is the world’s leading manufacturer of protective aftermarket equipment for utility ATVs. The company is based in Arlington, SD and ships to customers worldwide. 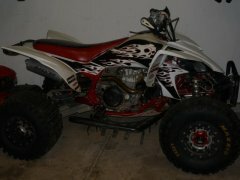 For more information, visit www.ATVBodyArmour.com. 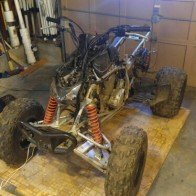 Would it be possible but also not to complicated to be able to put a crf50 motor in a cr85 frame? Just to clear it up a little. A SASE is a self-addressed stamped envelope. So address an envelope to yourself and put on stamps, and put it inside an envelope addressed to the company and send it off. If you are sending an email make sure to include your mailing address. 18033 South Santa Fe Ave.
Request one of their catalogs and you'll get a sheet of 7. Under "Choose an Interest" on the form, pick Sticker Request. Fill out the form and ask for stickers. Please state on the envelope whether you would like 6 inch or 8 inch stickers. If you are requesting 8 inch stickers than please make sure to send a large enough envelope. the cam gear. use the one nearest the 350 stamp. I found out the hard way.